With their high concentrate of healthy omega-3 fatty acids, carbohydrates, protein, fiber, antioxidants, and calcium, chia seeds are one of the most celebrated superfoods around. These tiny seeds pack a nutritious punch punch of nutrition. They are high in fiber but are also high in fat, so you don’t want to get too crazy. One ounce of chia seeds (about 2 tablespoons) contains about 139 calories, 4 grams of protein, 9 grams of fat, 12 grams carbohydrates and 11 grams of fiber, plus vitamins and minerals. 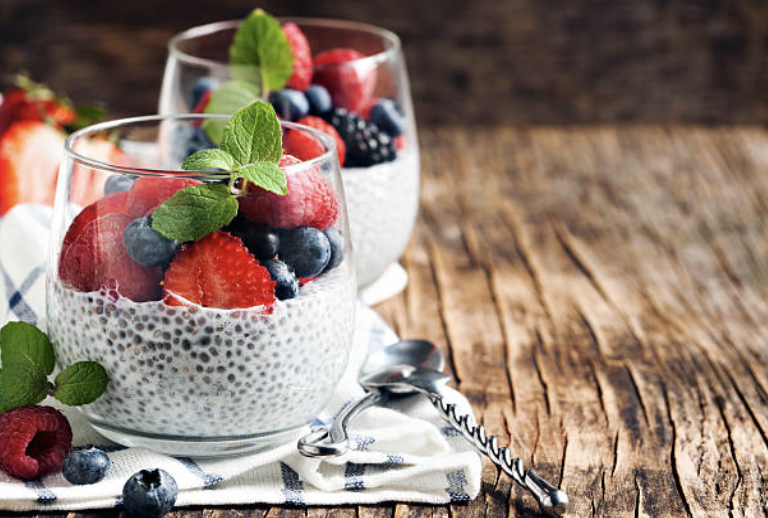 You can find chia seeds in all sorts of dishes from muffins to kombuchas, but one of our favorite recipes is chia pudding. This sweet, delicious treat can be served as a snack or as a showstopper for your guests at brunch. Chia pudding may look like a dessert, but if you’re a parent, this is a healthy way for kids to start the day without you having to fuss in the morning, as it’s an easy prep the night before. In a bowl or plastic storage container, stir together the milk, chia seeds, honey and vanilla. Place the bowl in the refrigerator overnight to thicken. Before serving the next morning, spoon into serving dishes and top with blueberries, coconut and toasted almonds. Tip: You can put these right into the individual serving dishes overnight and save one step! If you use glass dish ware like the ones pictured here, then they’ll look like delicious ice cream sundaes.